A little touch of magic for your space, this retro unicorn light really is the stuff of fairy tales! 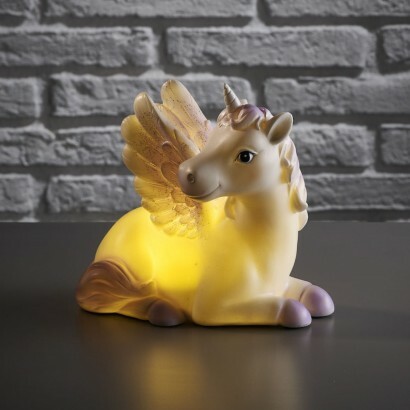 With glittered wings and a unicorn horn, the body of the unicorn is lit by white LEDs that shine through the body illuminating the lamp with a gentle glow. Ideal for kids rooms, or for older fairytale fans, this enchanting lamp is battery operated and can be placed any where in your home bringing a touch of fantasy and comforting light. True to photo even nicer in real life.my daughter hasn't got it yet as it's for her rd birthday but I'm sure she will love it.